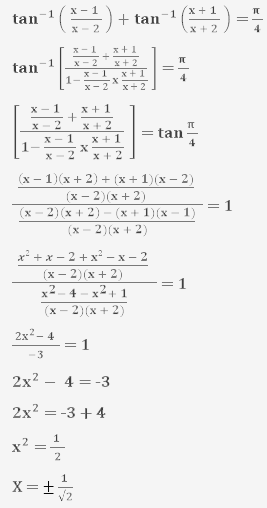 Question-1 :- Prove that 3sin-1 x = sin-1 (3x - 4x³), x ∈ [-1/2, 1/2]. 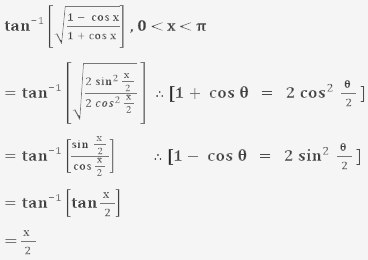 Let x = sin θ and θ = sin-1 x.
Question-2 :- Prove that 3cos-1 x = cos-1 (4x³ - 3x), x ∈ [1/2, 1]. Let x = cos θ and θ = cos-1 x.
Question-3 :- Prove that . Question-4 :- Prove that . Question-5 :- Write the function in simplest form : . Question-6 :- Write the function in simplest form : . Question-7 :- Write the function in simplest form : . Question-8 :- Write the function in simplest form : . Question-9 :- Write the function in simplest form : . Question-10 :- Write the function in simplest form : . Question-11 :- Find the value of . 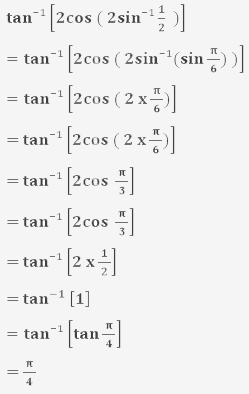 Question-12 :- Find the value of cot (tan-1a + cot-1a). Question-13 :- Find the value of . 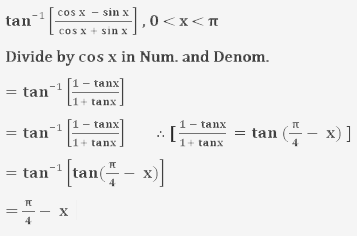 Question-14 :- Find the value of x, if sin (sin-1 1/5 + cos-1 x) = 1. Question-15 :- Find the value of . Question-16 :- Find the value of sin-1(sin 2π/3). 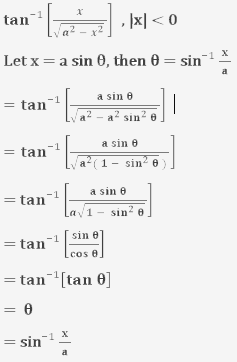 Range of sin-1 is [-π/2, π/2], so 2π/3 is not in Range. 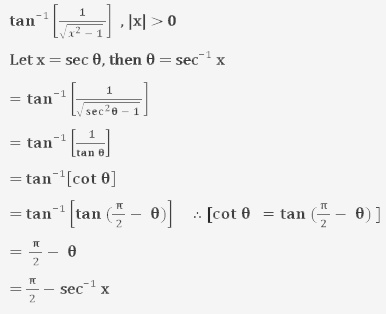 Then we break 2π/3. 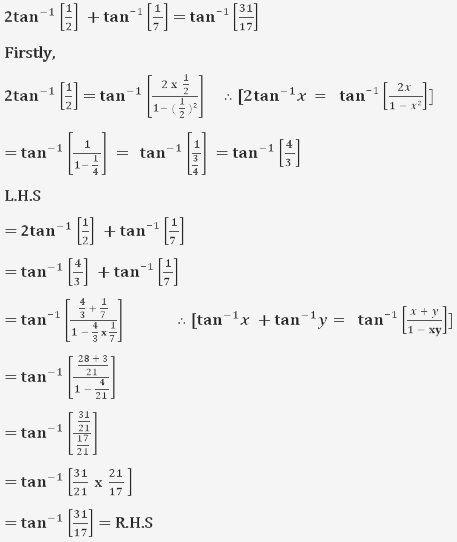 Question-17 :- Find the value of tan-1(tan 3π/4). 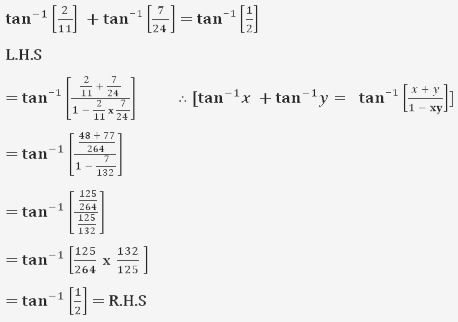 Range of tan-1 is [-π/2, π/2], so 3π/4 is not in Range. Then we break 3π/4. 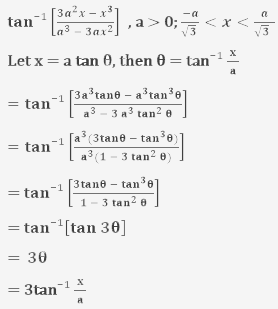 Question-18 :- Find the value of tan(sin-1 3/5 + cot-1 3/2). 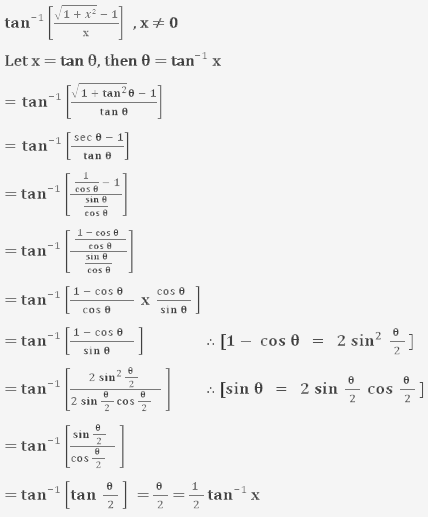 Range of cos-1 is [0, π], so 7π/6 is not in Range. Then we break 7π/6.